ALL our ribbon rosettes are manufactured using top quality 100% acetate satin and are available in our entire range of ribbon colours to ensure that your individual rosette requirements can be fully satisfied. 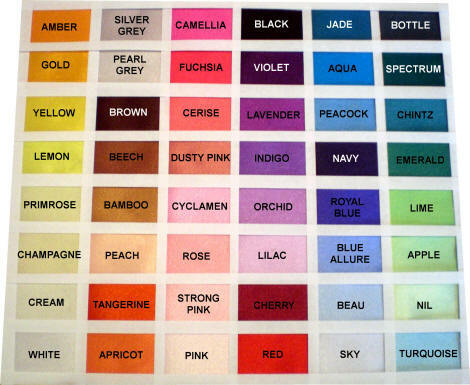 We now offer 48 exciting shades ranging from pastel hues (e.g. lilac and pink) through to vibrant tones (e.g. lime green and fuchsia)! NEW COLOURS Camellia, Orchid, Lavender and Blue Allure! 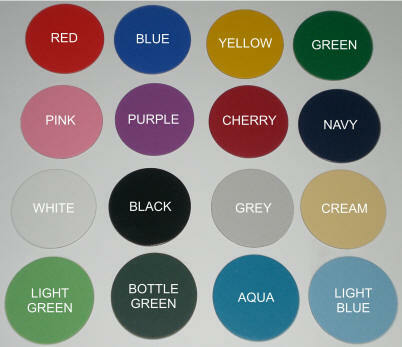 Colours shown are for guidance purposes only, we are happy to provide samples on request. Please note that Peacock and Primrose have been discontinued by our suppliers but are available in limited quantities. Our ribbon colour range includes all the standard competition award colours i.e. Why not enhance your rosettes for that extra special occasion? Shown below in the order of; White, Champagne, Yellow, Gold, Amber, Tangerine, Strong pink, Cerise, Red, Cherry, Lilac, Purple, Blue Allure, Royal Blue, Navy, Aqua, Apple Green, Emerald, Bottle Green and Black. Please see our special rosette page for further details of our tartan, polka and gold line rosette ranges. However all these ribbons are available for you to customise your own designs, please see below for pricing details. (Colours shown are for guidance purposes only).